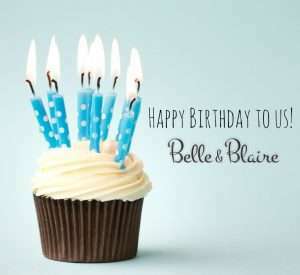 Home » Business » Belle & Blaire Turns 5! Belle & Blaire Turns 5! On December 3, 2011 Braquel’s Bathroom was officially opened on Etsy. After a name change and thousands of products sold, we are still here 5 years later, growing and thriving! We are proud of what we have accomplished in a crowded handmade bath & body marketplace, but none of it would have been possible without our customers who gave our products a chance. We may not be as polished or as popular as some other handmade bath & body product shops, but we believe our products exceed in quality and our commitment to providing excellent customer service remains our top priority. As we close out 2016, we can truly say this is our best year to date. We’ve expanded our product line to include skin care and personal care products made from all natural ingredients and the feedback from our customers has been amazing. We’re just as excited and passionate about sharing new products we have on deck for the new year as we were on day one. Five years is major, thank you!